Native to the Mediterranean basin and Southern Asia, the fig tree (Ficus carica) has been cultivated and enjoyed for centuries. Because they are small, growing fig trees in a garden is perfectly possible, given the right conditions for them to thrive. There are different types of figs, but common figs do not require pollination for fruit production and are easy to cultivate at home. The common fig is very hardy of desert heat and cold, and grows well in USDA zones 6-11; however, some basic growing guidelines need to be followed in order to succeed on its cultivation. Learn how to plant a fig tree and take care of it to enjoy its medicinal benefits and sweet fruits year-round! Figs can grow in a wide variety of soils and are fairly tolerant to moderate salinity; however, it is strongly recommended to perform a soil test before planting. If the soil pH is low, it must be adjusted to pH 5.5 - 6.5 with dolomitic limestone, which needs to be spread evenly over the entire area where the figs will be planted, before carefully tilling the soil. This work should be done in an area that covers at least a 6-foot by 6-foot (2x2 m). When it comes to growing fig trees, it is important to notice that their root system is typically shallow and spreading, sometimes covering 50 feet (15 m) of ground, but in permeable soil some of the roots may descend to 20 feet (6 m) deep. For growing fig trees in containers, a growing mix can be prepared using loamy and well-drained soil, with lots of compost or well-rotted manure; heavy soils can be lighten by incorporating a soil-less growing mixture containing peat moss, perlite, and vermiculite. The site should be exposed to at least eight hours of full sun every day during the growing stage. It is important to ensure there are no nearby plants, since fig trees will often shade out competing vegetation below their canopy. Before being planted, the bare-root tree must be pruned about one-third of its top, unless it comes topped from the nursery. Bare-root figs should be planted at least eight inches deep (20 cm), anytime during the dormant season, but late winter or early spring is best; container-grown plants can be planted any time of the year in warm climates. Bushy figs may be set as close as 10 feet (3 m) apart in the row and 15 feet (5 m) apart between rows. Fig trees form should be set 15 - 20 feet (5-6 m) apart in the row and 20 feet (6 m) apart between rows. Growing fig trees in containers, such as half whiskey barrels or others, is fairly easy as long as they are about 30-gallon size. This can be convenient in more tempered regions, since the containers can be moved into a protected area for the winter. The root restriction resulting from this type of culture may improve yields and reduce the days to harvest. Growing figs from from seed, even seed extracted from commercial dried fruits, is also possible. Seeds may be large, medium, small or minute and range in number from 30 to 1,600 per fruit. However, growing fig trees from cuttings is a much more common practice. The cuttings should be taken from a mature fig tree, two to three years of age, and ideally they should have 0.5 - 0.8 inches (1.25 - 2 cm) thick and 8 - 12 inches (20-30 cm) long. The cuttings are raised in nursery beds and are set out in the field after 12 - 15 months. The advantage of growing fig trees in containers is that they can be transplanted without being pruned; the plants need to be removed from the container and their roots should be spread before setting them in the planting hole. 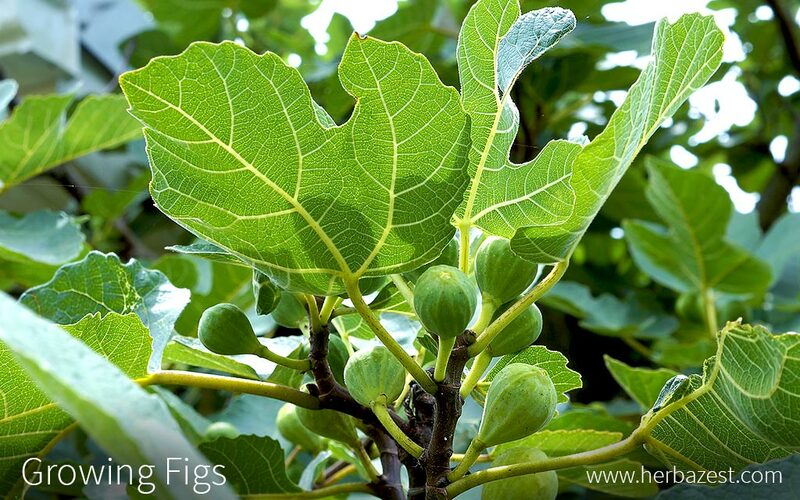 Figs need to be watered regularly but in moderation, since the plants will not tolerate excessively wet soil. However, they need plenty of water during the fruiting season. Care should also be taken to prevent root rot, which may arise due to high soil humidity. Using mulch will help retain moisture and also deter pests. Applying fertilizers too late in the growing season is counterproductive, since it will encourage new growth that cannot harden off before winter. Figs planted in the ground don't often need fertilization, except when growing in sand, or if the branches grew less than a foot since last year. However, they respond very well to heavy applications of manure and compost. A soil test is always recommendable in order to decide a proper amount of nutrients for the fig trees. if necessary, two to three cups of a balanced fertilizer, with micronutrients can be applied three times a year to mature in-ground plants. amounts of compost and a high-nitrogen fertilizer, such as cottonseed, soybean, or alfalfa meal. While figs do not require special pruning to produce fruit, this can be done to stop excess growth and facilitate harvest. Pruning should be done only after the fruit ripens, early in the summer; a heavy winter pruning has the potential to eliminate the next year's crop. Some weeding can be done before planting, in order to clear the area; however, fig trees will often shade out competing vegetation below their canopy, so when they are established this won't be necessary. Fig trees are prone to attack by root-knot nematodes, especially when growing in warm zones, with light, sandy soils. This type of infestation is easy to diagnose by uncovering some roots and inspecting them. The presence of tiny galls or swellings on the roots, in a good indicator for root-knot nematodes. The best control is to destroy infected plants and not use that site for figs again. A layer of heavy mulch can protect the the plants, as well as proper application of nematicides. Fig trees and fruit are sometimes attacked by borers, mealybugs, and scale insects. Dried-fruit beetles sometimes enter figs through the eye of the fruit and cause them to sour. The infested wood and fruit must be pruned and burned. Piles of leaves and fruit that accumulate around the trees should be removed, since they are perfect breeding sites for insects. Fig rust is a fairly serious fungal disease that attacks young leaves, causing defoliation. It can be identified by small yellow-green spots that appear on leaves. These spots get bigger until the leaves turn yellowish brown and fall. Fig rust can be controlled by taking preventive measures, like spraying the new leaves with a fungicide at three-to-four-week intervals (more often in rainy weather). This will also protect the plants against other leaf and twig blights. Mosaic is a viral disease to which figs are more or less susceptible. The plainest symptom is mottled leaves. Some varieties infected by mosaic show dwarfed leaves and fruit; others are scarcely affected. Mosaic is incurable but is rarely a reason to discard plants. Figs may take three to four years to produce a viable crop, depending on care and weather conditions. Long periods of dry, hot weather can reduce fruit quality. Fruit usually ripens between July and October, but as early as June, during the "breba" season, the first fruits can be harvested by hand. Their size and taste varies according to the variety. When harvesting figs, it is highly recommended to wear gloves and protective clothing, since the natural latex of the plant can cause skin reactions. Once harvested, the fig fruits should be spread out in the shade for the rest of the day, so that the latex can dry a little. Then they can be stored to be consumed. A fig tree can bear 180 to 360 fruits per year. Fresh, raw figs are very perishable. They can be kept refrigerated for 8 days, at 40-43°F (4-6°C) and 75% relative humidity, but once they are removed from storage, their shelf life will be one to two days. At 50°F (10°C) and relative humidity of 85%, figs can be kept no longer than 21 days. They remain in good condition for 30 days when stored at 32-35° F (0-2° C). If frozen whole, fig fruits can be maintained for several months.